Could the conspirators be setting up a transfer of manipulation from London to Shanghai under another Rothschild banking syndicate? Why not, the Rothschilds had been one of the London fixing members for 200 years. Last week the UK's Financial Conduct Authority fined Barclays for rigging the gold price at a gold fix for the disadvantage of a customer and the benefit of the bank's book. This news could not come at a worse time for the London Bullion Market and the London Gold Market Fixing Limited, the company directly responsible for the twice-daily fix. It may well lead to the end of the gold fix, the silver fix already being axed in August. The fix is a process by which the four fixing members match their orders at an agreed price. The London bullion market is over-the-counter without the formal price records of a regulated market. The fix is therefore a needed reference price, and its status and the liquidity that follows have been central to London being the world's major bullion dealing centre. 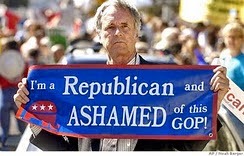 There are two problems with the fix. The first is it potentially distorts the market by delaying pre-fix business and bringing post-fix business forward. The second is that customers have to trust the fixing banks, who are also dealing for themselves into the fix. And this is what tripped up Barclays. Outside the fix it should be reasonably clear to clients whether a bank is operating as principal or agent. During the fix roles can become opaque, and unscrupulous dealers can find ways to game the system. Claims that the Barclays case was an isolated instance may be true, but indications that the FCA is treating this as a one-off and not investigating other banks may be ultimately damaging to the market's reputation. Then there are the separate circumstances of Deutsche Bank's resignation of its fixing seats on both gold and silver. Last December Deutsche Bank was instructed by the German banking regulator, BaFin, to hand over documents in connection with its enquiry into gold and silver price fixing. Four weeks later the bank announced it was resigning its seats on the gold and silver fixes. While it is premature to positively link the resignations with BaFin's enquiry, the coincidence raises the possibility that banks which have settled with regulators over accusations of fixing LIBOR may have a case to answer in precious metals as well. Interestingly, there are no buyers for Deutsche's seats, suggesting legal and compliance officers at other bullion banks also have doubts about the fixing process. To give this topic further context it should be noted that London has seen some unusual price movements in the past. 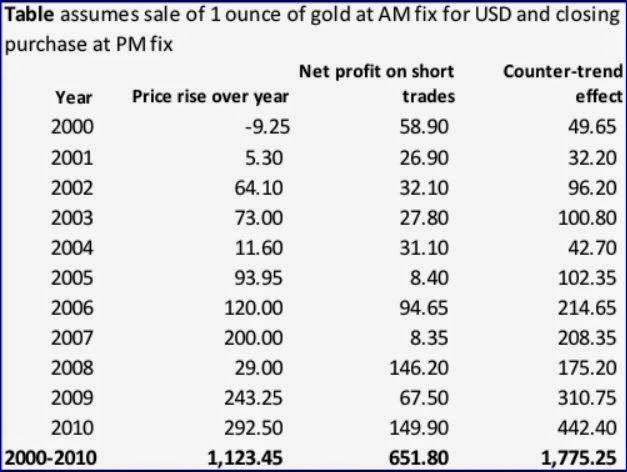 The table below shows the profits generated by shorting one ounce of gold on the morning fix and buying it back at the afternoon fix every day for the eleven years 2000-2010, covering most of the largest bull market in the LBMA's history. This phenomenon was first drawn to public attention a few years ago by an American analyst, Adrian Douglas. In every year this short trade would have been profitable, despite a rise in the gold price from $282.05 to $1405.50 in December 2010, a rise of 400%. This extraordinary price behaviour was confined to London trading hours. So hard statistics tell us gold has been behaving unusually in London hours for a considerable time. The LBMA is not a regulated market, but derivatives and share prices based on precious metals are, so regulators have a duty to be interested. The FCA should broaden its investigations accordingly, but whether it does or not it is hard to see how the twice-daily gold fix can survive.